A Sennebogen 7700 crawler crane has been used to construct an 800m-long motorway bridge in Russia. The 300t crane was delivered by LLC Lonmadi Saint Petersburg, Sennebogen’s sales and service partner for Russia, to construction company BaltMostStroy in the second half of 2013. 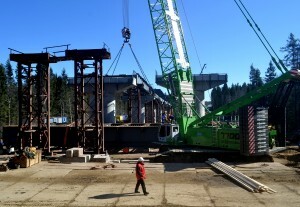 The job included lifting prefabricated steel parts weighing up to 100t onto the concrete foundations of the bridge, which is part of the new A121 motorway being constructed between St Petersburg and Priosersk-Sortavala. The Sennebogen 7700, which features a 41m boom and auxiliary jib, was required to navigate hilly terrain while lifting the parts perfectly horizontally, and accurate alignment was necessary to securely place the chains and straps. Stability was provided by the 135t ballast and 8m-wide crawler undercarriage of the crane, while lifting was driven by a 313kW Caterpillar diesel engine with two 220kN winches. Manoeuvrability of the crane is improved by the compact upper carriage, which is the largest component of the 7700 and has a transport width of 3m. The boom sections, which feature a self-assembly system for quick set-up, and the Starlifter undercarriage have a maximum width of 2.43m, making transportation easier.